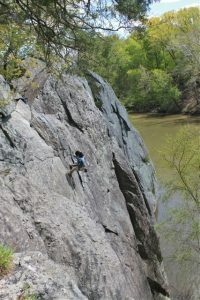 For those looking for a departure from the easy-going grade of the C&O Canal, you are invited to look upward to the Carderock Recreation Area. Located along the Canal, Carderock is best known for its rock climbing challenges on cliffs up to 80 feet high. There are routes here for climbers of all skill levels including many beginner climbs. Many rock climbing classes are taught here. If the more vertical routes aren’t your style, Carderock still has plenty to offer. Hike on the canal, access the more challenging Billy Goat Trails (A, B, and C), or take advantage of outstanding picnic facilities for small or large groups. Please click here to make reservations at the pavilion. Carderock Recreation Area is located on the Clara Barton Parkway, one mile north of the Capital Beltway (exit 41).